Paul writes, “For everyone has sinned; we all fall short of God’s glorious standard. Yet God, with undeserved kindness, declares that we are righteous. He did this through Christ Jesus when He freed us from the penalty for our sins.” (Romans 3:22-24 NLT) Paul reminds us that even though we fail/fall our hope lies beyond ourselves, beyond the grave in the far reaches of God’s love as illustrated through Jesus’ life, death, and resurrection. 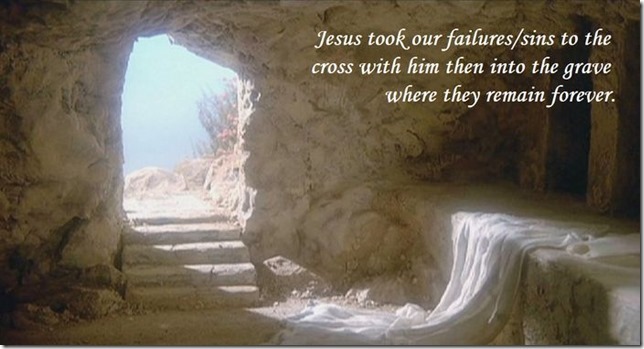 Jesus took our failures/sins to the cross with him then into the grave where they remain forever. We are not failures, we are followers of Jesus, children of the Living God!